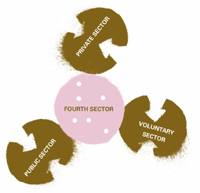 UPDATE: That article is now online at the CMS website under “Mission and the Fourth Sector”. ORIGINAL: I just wrote an article about Co-operatives and social enterprises for a missions publication. I made reference to our new venture – The Old Sorting Room – which we will launch in a few months and which can only be described as our monastic-inspired cooperative-run social-enterprise micro-business fourth-sector for-benefit organisation. For lack of a better word. Or lack of any word at all that describes it. Fourth sector is a newish word that appeared on the radar last year after New York Times ran a piece entitled “Businesses Try to Make Money and Save the World. The fourth sector is a word used to describe the new organisations that straddle the line between government, business and charity. I have been exploring the idea of the fourth sector and missions, since this blurring of boundaries has been a common thread in the missions world for a long time. I believe the ideas put forward in the 1850’s by Henry Venn of the Church Missionary Society on the kind of economic structures necessary for Sierra Leone to be self supporting were indicative of the first known cooperative of the 1840’s in Rochdale as well as cooperatives in general since that time. Venn’s suggestions included directives for 1) credit unions, 2) social welfare organisations, 3) micro-business enterprise for production, 4) fair trade and product distribution through a cooperative store and 5) resources for training and education. He uses different words but the concepts are the same. Without financial sustainability, his goal of the “euthanasia of the mission” would not be possible. I also think the International Missionary Conference in Tambaram, Madras in 1938 landed on the right place (cooperative living and cooperative business ventures like Kagawa’s Christian Co-operative movement in Japan) as an answer to the economic issues of mission when Western money was drying up and foreign mission structures were suspect. Anyway, I will put up a link when the article is published. In the meantime, here are some links to articles on the subject. William Shutkin asks if the fourth sector is not a new specis of capitalism in The New Evolved Capitalism. I also bought a few books on Kagawa of Japan to research his use of Christian Co-operatives. Good post TSK. Devouring the links. Great stuff. Very fascinating topic. Something we have been talking a lot about at church and some of my other circles. My college ministry mission trip involves some work in Mexico City with a mirco-financing group called Amextra and some other self-sustaining organizations. hi andrew – so excited about the old sorting room you guys are getting going. have been hearing snippets about shannon’s evolving vision and sounds like it will be more pieces for the puzzle. trying to look into how boobyjuice can work within these kinds of set ups rather than just go down the normal manufacture/retail route. also, of excitement to me at the moment in terms of turning normal wys of doing things upside down is the art of skipping. i’ve blogged about it – thought you and sam might want to get up to mishchief in kirkwall someday soon! I am so glad to see you are blogging about the Fourth Sector. I had the pleasure of working for Fourth Sector Network over the summer where I helped organize a round table discussion on new legal forms for Fourth Sector Organizations. I would be happy to send this presentation to anyone who is interested. Also, I am currently writing a dissertation for my LL.M. on Fourth Sector Activity worldwide and would be grateful for any links or information about alternate corporate governance forms in Europe or Asia or the connection with celtic christianity. For more information about the emerging Fourth Sector, visit my website at http://www.alissamickels.com. Previous Post (p)	Birthdays in the house.